The Sheffield and District Convalescent and Hospital Services Council have been good friends to Middlewood and their latest gesture has been the provision of six hair drying units for the Hairdressing Salon. The official presentation was made my Mr. B. Cartledge who is the chairman of the Council’s Amenities Committee. 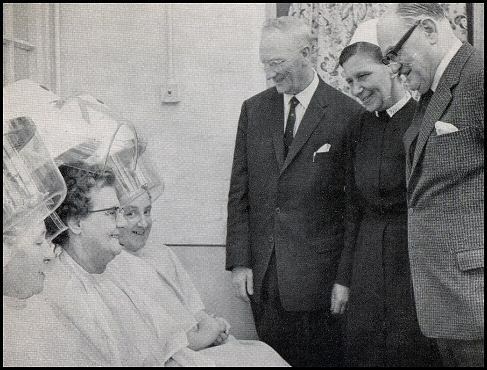 The above picture taken in 1967 shows Mr. Carledge (Dark glasses) chatting to the ladies who are enjoying the new hair dryers. 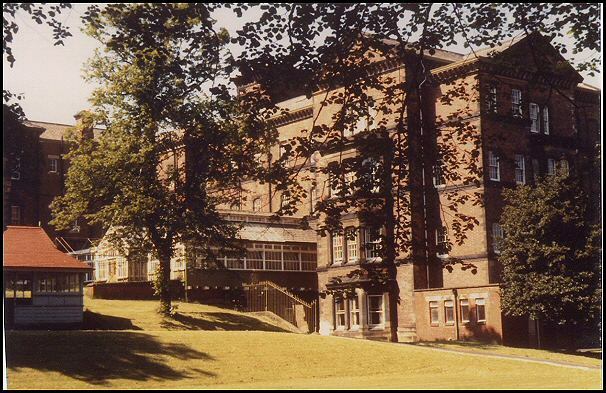 Believed to be the first of its kind in the country, a pilot course in mental health for district nurses, midwives and health visitors commenced at the education centre in Middlewood Hospital on 18th October 1967. 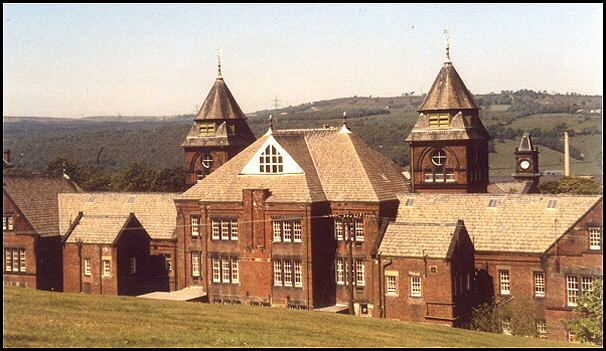 The course consisted of ten study days at weekly intervals and it was designed to help community nurses to a better understanding of mental disorder and to give improved support to families before, during and after a psychiatric breakdown. The photograph shows Mr B. Carledge welcoming members of the pilot course in mental health being held at the education centre. 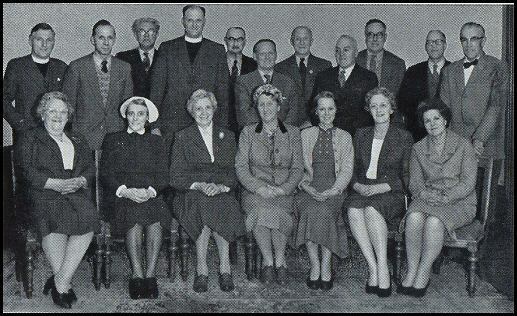 This is the Hospital Visitors' Association Committee in 1960. 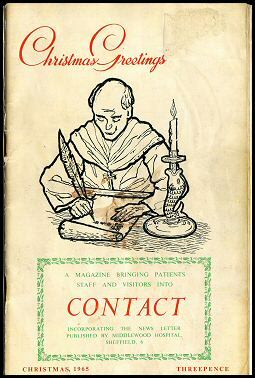 It was in December 1953 that the Visitors Association was founded because of the high proportion of psycho geriatric patients were not visited. The Association received strong support from relatives and friends and in a short time this voluntary service was extended to the whole hospital. 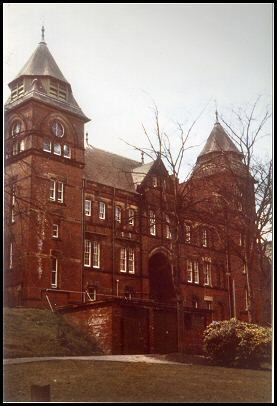 The patients of Middlewood Hospital received wonderful care and attention from Doctors and Nurses, but they also needed a social life. 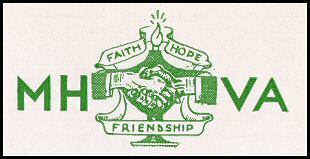 M. H. V. A. met their needs by arranging film, shows, dances, outings and many other activities. Some members of the association made regular visits to patients who had no family to visit them, taking the usual little gifts of home-made cakes, sweets and magazines, etc. Occasionally, two of these patients were taken to town for a cup of tea and a look round the shops. One of the patients received letters from her daughter who lived in America, but founded difficult in writing. A visitor answered the letter for her. Small gifts of cosmetics and jewellery brought much pleasure to the women patients as did also items of good clothing sometimes given by kind friends. 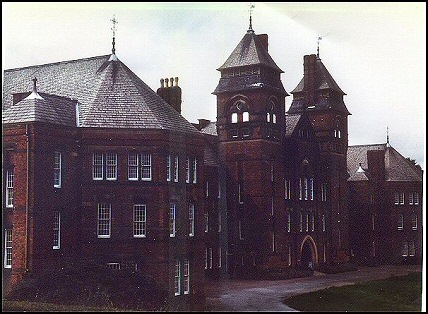 The proceeds of the sale of work held annually went to the reserve fund which was allowed to build up in order to purchase a convalescent home at the seaside, where groups of patients could be taken for holidays. 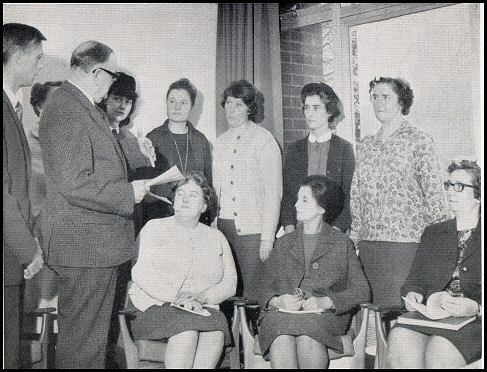 This is 'Middlewood Hospital Visitors Association' in their annual sale of work in 1967. 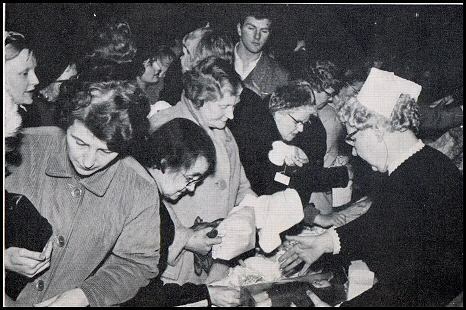 The Lord Mayor and Lady Mayoress of Sheffield, Alderman and Mrs. Harold Lambert were entertained by the Association at lunch, and afterwards opened the annual sale of work in November 25th 1967. The entertainments hall was crowded and the various stalls were kept busy. Although at the time of going to press the final figures was not available, the total raised so far was in the region of £ 600. 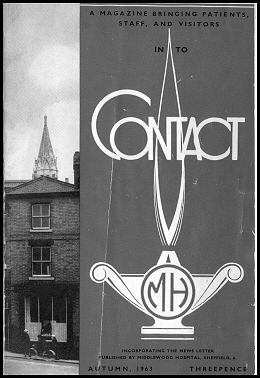 The Hospital magazine was established in 1952 for the benefit of patients and staff with the object of recording current and forthcoming events, including interesting news about patients and staff and to invite contributions such as stories and poems etc. 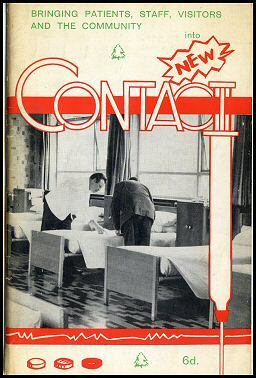 The magazine started as a monthly news letter but developed into an enlarged booklet published quarterly and called 'Contact'. 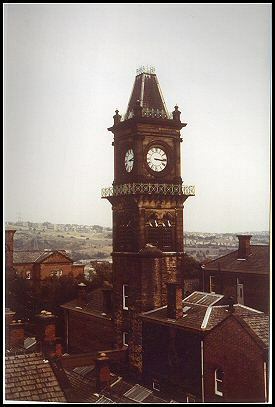 Its format was progressively improved, and its scope extended to reflect the activities of al the hospitals in the Sheffield 2 hospital group. « This is the late Rev. 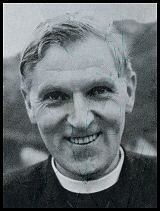 W. Farrow, Chaplain and founder of the 'Contact' magazine. He died in 1965. In 1966 the magazine cost three pence and was produced three times a year. The cost represented only a nominal sum compared with the actual cost of production. All above photos and information extracted from the hospital magazine. Supplied by Doreen and Eric Crowther who worked at the hospital for many years. 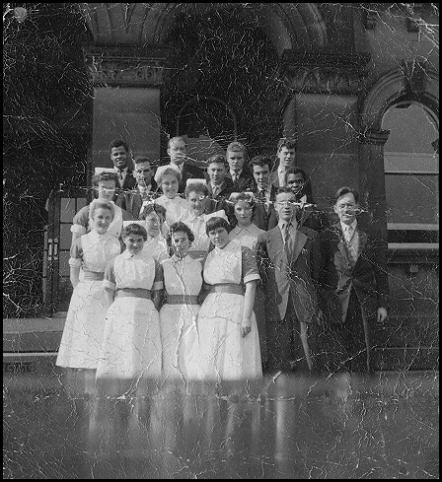 Middlewood student nurses posing on the steps of the Administration Building. 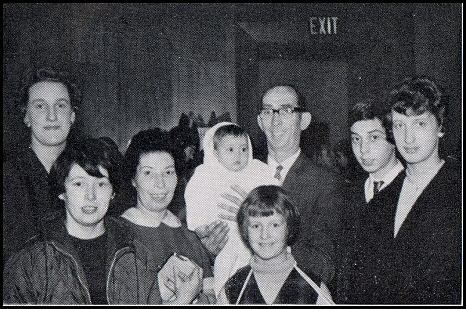 Eric Crowther is on the top right, next to the pillar. 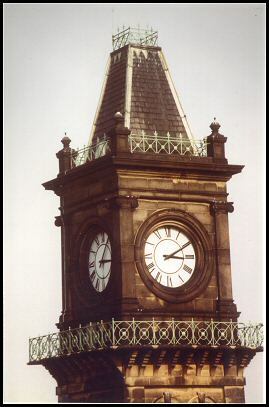 Photo taken in 1959. 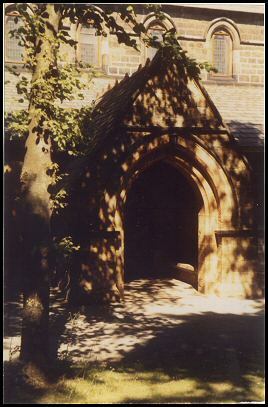 The Queenswood building and the entrance to the hospital church. Some wards of the hospital had very spacious conservatories. The fossil trees. Middlewood’s 250 Million-year-old-history. Within the hospital ground, there are a large tree stumps which have been verified by geologists as being 250 Million years old. They belong to the carboniferous age, long before the age of dinosaurs, when most of Europe and North America consisted of brackish swamp. Giant evergreen trees flourish, often reaching 100ft. height. These stumps are today completely petrified, but quite recognisable. 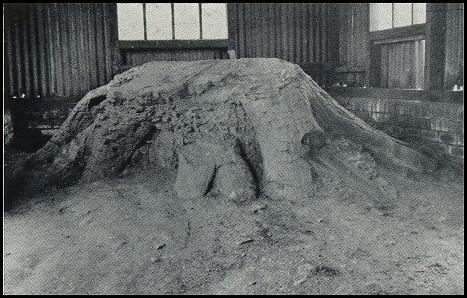 A report to the geological society suggested that they were one of the very few fossil tree specimens preserved in situ in England (some other examples are in museums). A shelter was built over the two largest stumps but this is now ruinous and the area around the trees overgrown. Middlewood has a very rare living tree. The Ginkgo or Maidenhair tree outside the central administration building, and an unusual tulip tree on the drive below the church. Please note that due to the redevelopment of the site, the fossil trees are currently covered to ‘protect’ them. It is hope that one day these trees may be uncovered and left exposed for the public to see. The rare tree outside the Administration Building it is difficult to determine if it is still there now. Words taken from the book called 'The Second Hillsborough' by Helen Mathers.